A Record-Setting Skyscraper is Calling My Name… Help Me Answer the Call! | Keep It Up, David! I’m very excited about my next race, in less than two weeks. It’s a brand new race in a brand new record-setting skyscraper. I’m so excited to compete in this race! I’ve raced in San Francisco four times before (in two different buildings), and I can’t wait to climb to the top of the tallest building in town! I need to raise $150 to compete in the race. Can you help? 100% of your tax-deductible donation goes towards cancer research. CLICK HERE TO VISIT MY PERSONAL PAGE AND DONATE! My other three races are ones I’ve done before, which means I have to go back and set new personal records! 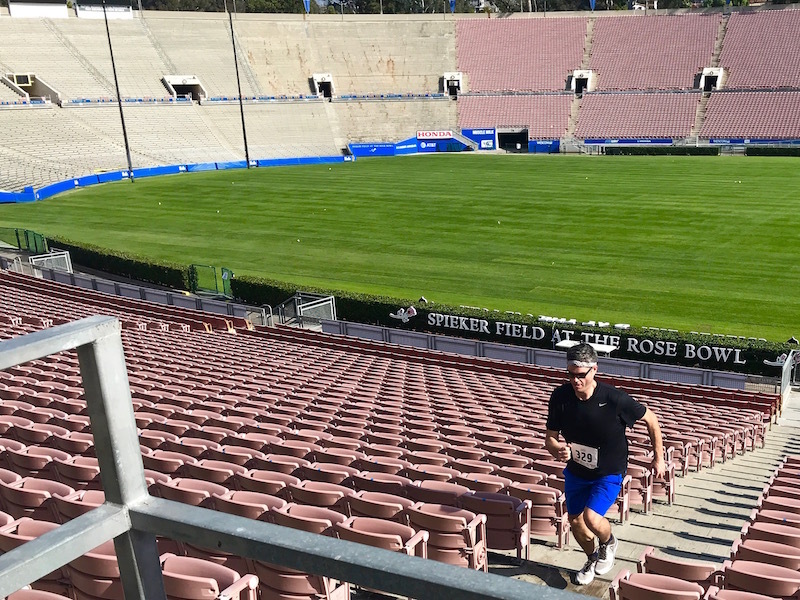 On December 2nd I’ll be competing in the Los Angeles CF Climb, a stair race up and down the aisles at the iconic Rose Bowl. I wasn’t feeling very well when I competed last year, so I can’t wait to go back and see what I can really do! This race benefits the Cystic Fibrosis Foundation, an organization that I love, not only because of the great work they do, but because they host lots of stair events across the country. I’ve competed in about a dozen over the years. I need to raise $100 to compete in the race. Can you help? CLICK HERE TO VISIT MY PERSONAL PAGE AND DONATE! Okay, I’m done asking you to part with your money. I think I might be done until 2019! Thank you so much for even considering a donation on my behalf. These races push me to push myself, and have been instrumental in my keeping my weight off. Oh, and if you visit a fundraising page and see that I’ve reached my goal, will you donate to the other one? It would be great to reach both goals before going above and beyond. I am competing in additional races though! 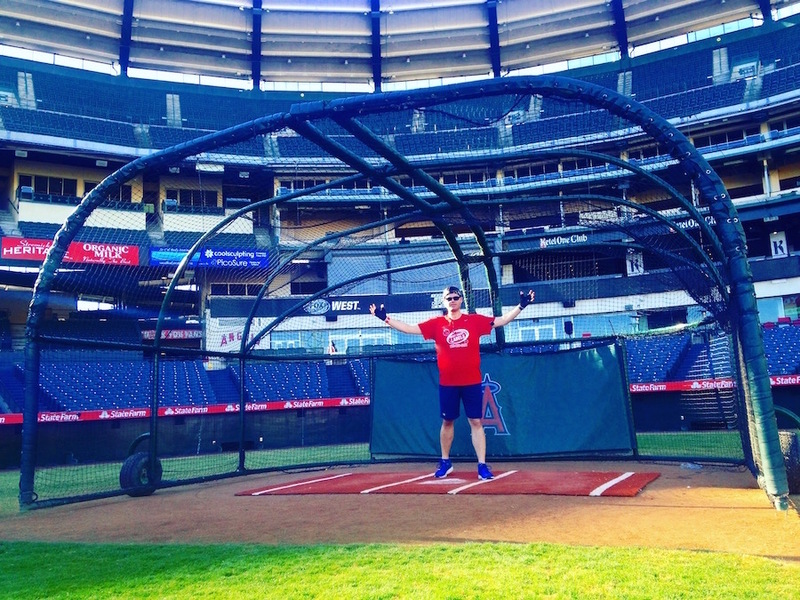 On December 8th, I’ll be competing in my fifth Hike the Halo, another CFF stadium race that goes up and down the aisles at Angel Stadium in Anaheim. This is a fundraiser, but I already got it covered, so you’re off the hook. 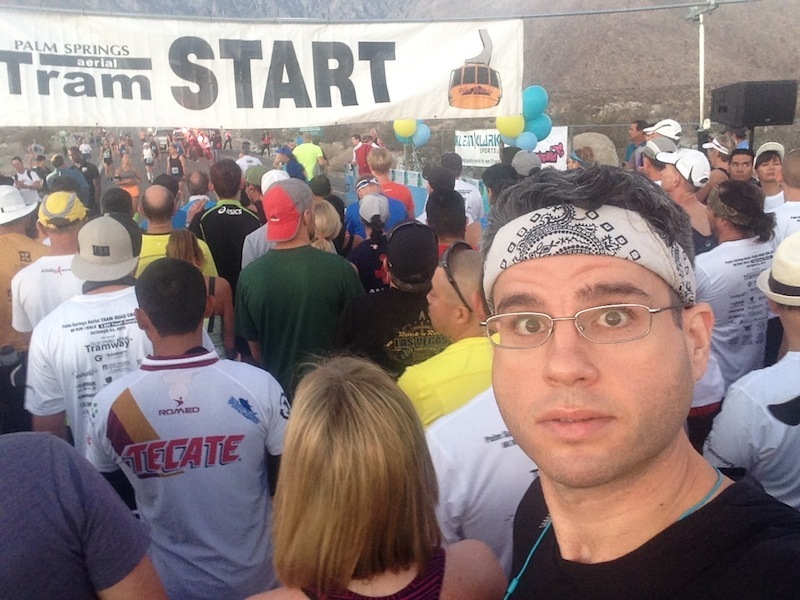 Lastly, later this month I’ll be competing in the Palm Springs Tram Road Challenge. It’s a 6k running race, all uphill, with a total of 2,000 feet of elevation gain. (And no fundraising needed!) It’s a brutally hard race, but I’ve done it before (twice! ), so I know I can do it again. These four races will keep me busy and motivated, and they’ll help prepare me for 2019. While I don’t have next year’s entire race itinerary nailed down yet, I’ve got a couple new races in my sights – and one is international! Before I go, I want to share a quick little knickknack that I picked up at my last race. 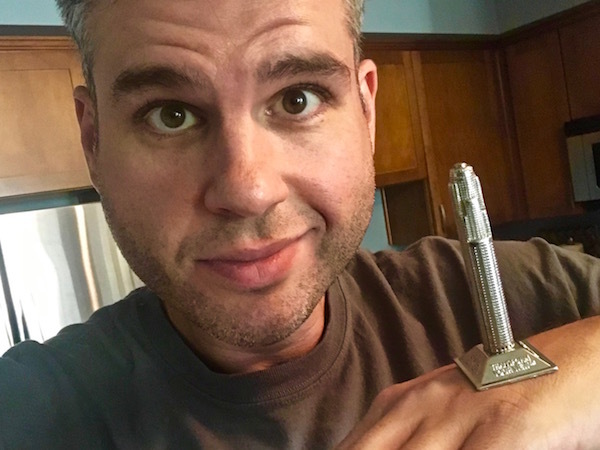 The US Bank Tower has a gift shop, and I picked up a little metal replica of the tower. I love visual reminders of my race accomplishments, and purchasing this one to commemorate six races in that building was a no-brainer. It went immediately on my shelf with my other skyscrapers replicas (some LEGO, some not). 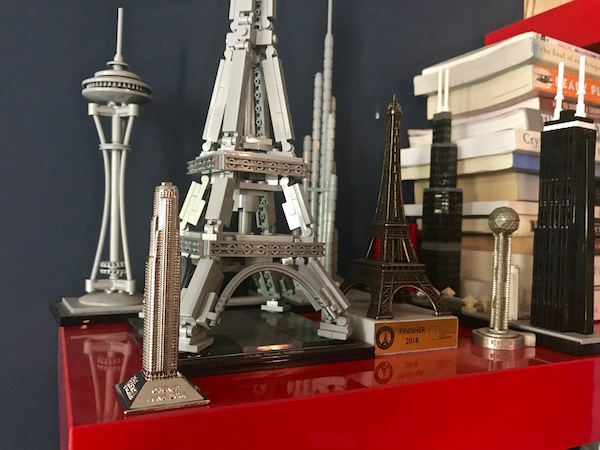 Look around and you’ll see the Eiffel Tower (a LEGO version AND the trophy I earned when I competed there), Willis Tower, John Hancock Center, Space Needle, and Reunion Tower. There’s even a Burj Khalifa in the back, and while I haven’t raced it for real, I did a Burj Khalifa virtual climb and raised over $1,600 for charity. This entry was posted on Sunday, October 7th, 2018 at 10:47 pm and is filed under Uncategorized. You can follow any responses to this entry through the RSS 2.0 feed. You can leave a response, or trackback from your own site. 2 Responses to A Record-Setting Skyscraper is Calling My Name… Help Me Answer the Call! After doing some math on the published stats for Salesforce Tower, I suspected there’s an error, so I researched it. You’ll “only” be climbing about 912 feet, not 1,070. Exciting, but LA’s USB is still the tallest staircase west of Chicago. Here’s a link to a PDF illustration. If Runyon’s step-count is correct, it has roughly 6.1″ steps compared to USB’s 7.3″ average. You should easily be able to tell the difference between an extra inch on the steps, so I’ll be interested in reading your recap to see if my analysis holds true. Have fun! Thanks for doing more thorough research than me. I updated my blog accordingly. 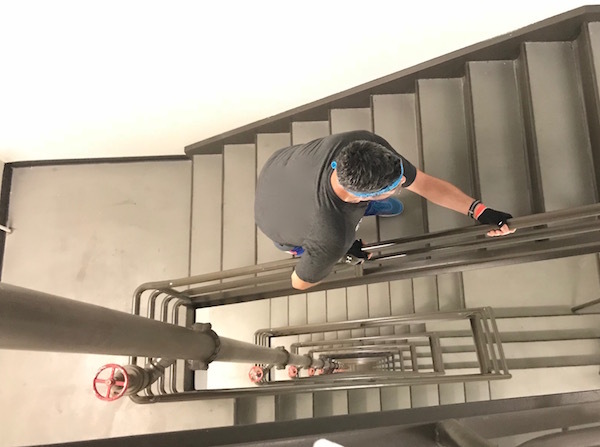 I suspect the step count may be off – 29 steps per floor seems abnormally high… but maybe the floors are unusually tall! We’ll see!